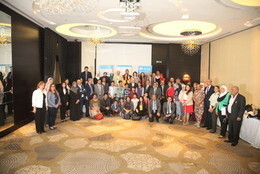 ACCD, in partnership with AGFUND, the League of Arab States (LAS), the National Council for Family Affairs and UNICEF (Jordan Office), has held a regional workshop on Professional Guidelines for Arab Media Addressing the Issues of Child Rights under the slogan of "Child Friendly Media", during the period 1-2 November 2016 in Amman, under the patronage and in the presence of HE Mr. Nabih Shukam Al Akram, the Jordanian Minister of Culture. The Workshop has been attended by more than 30 media representatives from the various media outlets and child-concerned institutions from eight Arab countries: Jordan, Iraq, Oman, Palestine, Lebanon, Libya, Egypt, Yemen. After the UAE, Lebanon and Egypt, journalists from 8 Arab countries announce their agreement and commitment to the Professional Guidelines for Arab Media Addressing the Issues of Child Rights. The events of this regional workshop have witnessed an effective participation of the parliament children of Princess Salma Bint Abdullah Cultural Center in Jordan, where a number of children presented their experience in the said parliament and asked for opportunities to participate in the preparation and broadcast of the media programs addressing them, in order to achieve the principle of participation, dialogue and freedom of opinion and to enhance their roles in public life. It is worth mentioning that ACCD, with the support of AGFUND, has previously contributed to the establishment of Princess Salma Bint Abdullah Cultural Center and the initiative of establishing Children's Parliament within the Center, in cooperation with the Jordanian Ministry of Culture.